Avengers New Code Update from outta nowhere! Like a Randy Orton R-K-O in mid-air … from outta nowhere. 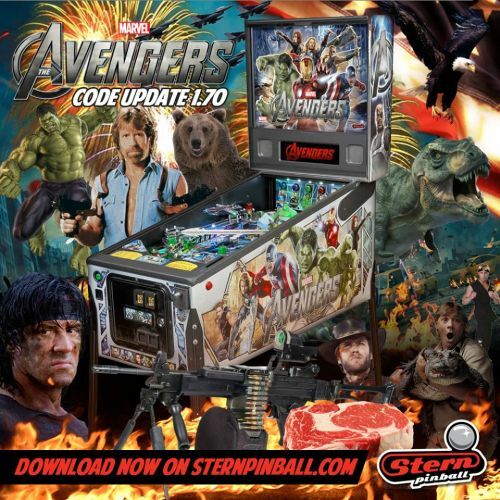 Stern powerbombs a code update for Avengers. Apparently from the picture above, Rambo, Steve Irwin, Chuck Norris, a T-Rex, a random bear and ‘Murica all agree that the update is good. There are a number of fixes, scoring adjustments and feature updates that seeks to address certain exploits. Thank goodness for an update to a game I previously thought was abandoned. This means any game could get an update. Doesn’t it? DOESN’T IT? Does the code update address the “Hawkeye left orbit all day” strategy and the “Hawkeye vs. Black Widow All Day” strategy and the “Multiball plus get all the bonus hold + bonus X hold + add bonus X awards from the Shield targets” exploit? A glance at the update details shows that the answer is possibly “yes” in this case. How about the “I don’t wanna shoot the Black Widow ramp at all” strategy because a good, powerful, accurate Black Widow shot can fail in two to four different places. The spinner can stop the ball. The hairpin left turn combined with the first lip of the bridge can reject the ball. The ball drop into the VUK can fall out. Again, a glance at the update details shows that the answer is “yes” for this case as well. Plus, the shot has the potential to be worth much more than it used to be. That helps. Sort of like how you may not like eating your vegetables, but they are really good for you. So, you should really think about taking that Black Widow shot. the only available ball to add was in the Loki lock. – fixed a problem with the Loki lock post double firing as balls pass thru the lock. transitioned thru the lock area during multiball events. – Added dot animations to Battle for Earth wizard mode. – added “Push Start” button graphics when credits exist. – Battle for Earth level 2 jackpot speech is now less repetitive. – added center spinner display effect. – added center spinner display graphics to Black Widow mode start. – fixed a problem with the MAX BONUS X award given by SHIELD. – fixed a SHIELD display presentation problem (scores not shown properly). carry over to the next ball, default = No, carry over not allowed. – added spinner rule/graphics to Black Widow advance. – spinner starts at 5K per spin. – pops start at 5K per spin. default = Yes, Spinner awards B.W. Ramp. – added speech if flippers are pressed during the attract mode. – difficulty setting now require less pop bumper hits to finish Captain America battle round. – added ball saver & ball saver adjustment to “Attack on the Helicarrier”. – changed bottom lane rule, i.e. left flipper alternates “LO” lamps, right flipper alternates “KI” lamps. – added difficulty settings to all the VS modes. – added VS mode difficulty setting to Extra Easy, Easy, Medium, Hard, Extra Hard, etc.. presets. – added “Battle for Earth” difficulty and ball save settings to Extra Easy, Easy, Medium, Hard, Extra Hard, etc.. presets. – you can no longer advance Hawkeye if “Attack on the Helicarrier” or “Battle for Earth” wizard modes are ready to start. to avoid the bridge from getting hung up on Hulk’s arm (LE only). – “Attack on the Helicarrier” wizard mode can now start while the Tesseract mode is active. – “S.H.I.E.L.D” mystery award now advances Bonus X by “1” instead of “3”. – “Bonus X Hold” is no longer a “S.H.I.E.L.D” mystery award. – “Bonus Hold” is no longer a “S.H.I.E.L.D” mystery award. – “Attack on the Helicarier” now shows number of shots remaining to complete. – Shots to the Black Widow ramp will divert the ball to the Hulk Eject if Extra Ball is lit. – Shots to the Black Widow ramp will divert the ball to the Hulk Eject for the final shot in “Battle for Earth”. – Hulk drop targets now pause before resetting in case a ball falls back into the Hulk eject. – Hulk drop targets remain down during Attack on the Helicarrier. – Hulk drop targets remain down during Battle for Earth. – Changed rules for Battle for Earth which now has 4 levels. – added difficulty setting for Battle for Earth. – Added slingshot power adjustment and implementation. – Fixed a bug with the mystery lit background lamp effect. – Fixed a translation that was off of the display. – Removed unused tesseract adjustment. – removed a hulk multiball start speech call that is only used on the LE version of the game. – included the playfield lights in the match display effect, they do a ground pound effect now. – Black Widow skill shot not available on the Pro model.